If there’s one thing I can’t resist it’s a hole in the ground. Whenever I see one – which is often in London – I have to peek inside. What do I hope to see find? Roman coins, a secret pavement, a Victorian sewer, an uncovered river, clay pipes, Tudor jewellery, treasure, booty, anything strange, fascinating and previously buried. 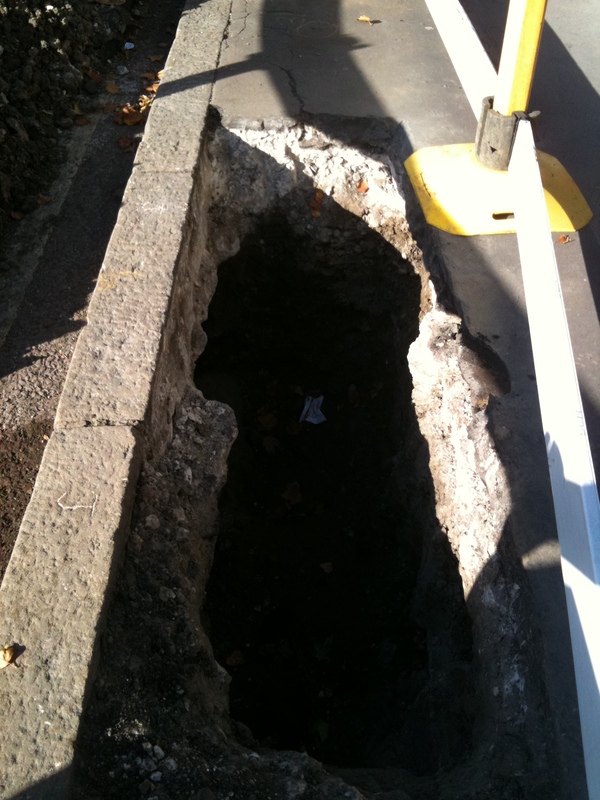 This entry was posted in London, Subterranean and tagged buried treasure, Herne Hill, Potholes. Bookmark the permalink. Oh, oh, this is interesting. Holes are quintessentially a curious thing. You just have to look. There was this <a href="namehere“>ginormous hole in Guatemala, but I wouldn’t look in there. Anyways, you are wrong about London having many of those. You should see Sofia. It’s in Bulgaria. Sofia, Bulgaria is the Capital of the Road Holes. Usually you find a large auto-repair bill inside. Have you looked inside the absolutely enormous hole in the economy ? It was dug over a period of thirteen years or so by lots of bureaucrats beavering away in the dead of night to please their Labour Party masters in the corridors of power. You’ll definitely find lots of murky things in that particular hole if your peer into it closely enough ! Heather Brooke only had a quick peek and look what she turned up !! Bernard Cribbins dug that hole. Or was it Steve Bruce.